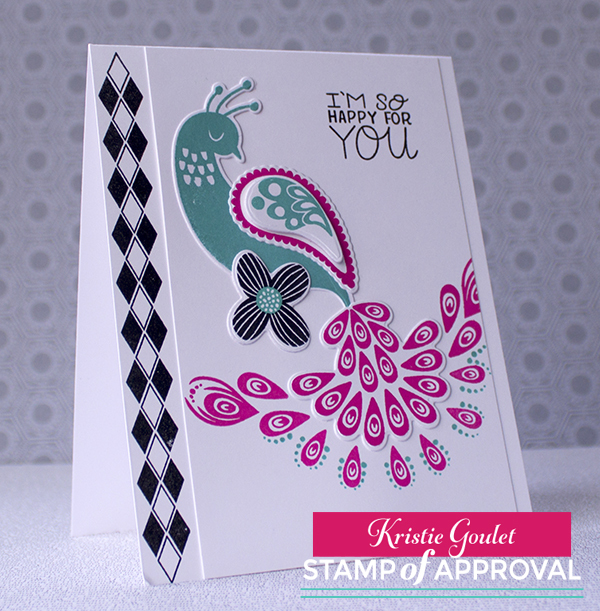 Your cards are stunning, Kristie! Your cards are gorgeous! Love your color scheme! I love your cards. Can't wait to get my hands on that peacock stamp. I am more partial to the flowers instead of the peacock. Both are beautiful. Thank you for the giveaway! Love them both but the Peacock is my favorite! I can't wait to play with it! Both of yours cards are beautiful. I can't pick a favorite but those colors are my favorite for sure!! 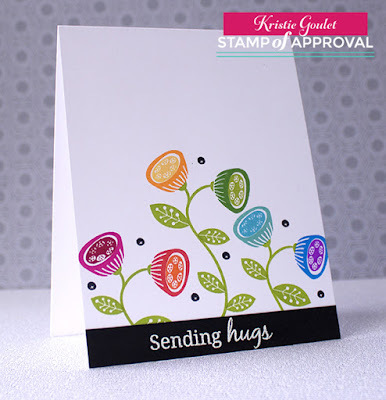 As usual Kristie, your cards are gorgeous!! Love those fun flowers and that crisp b&w border with that peacock is fantastic! Love that peacock! It is absolutely stunning! And of course, the inks are fabulous, too! Both cards are beautiful! I love the colors and details on them. Thanks for sharing on the blog hop!! Both are great cards. I especially like the color combo for the peacock. These cards are so whimsical! AM loving this box! This collection is just way to exciting! Both of your cards are absolutely stunning! I'm loving this collection. I am half way through the blog hop and my brain is so full of excellent inspiration! Your cards are fan-tab-ulous! WOW! I love these cards. That peacock is gorgeous. I love how the fuschia and aquatini complement each other! Love your cards! I'm not a big fan of paisley, but you are on the way to converting me! I really love the funky flowers in the second card, and those colors really pop! Kristie, these are beautiful. If you use brown on the second card you would have a Reese's cup flower. But, the flowers turned out beautifully. Thanks for sharing. Both of your cards are beautiful. Absolutely love that peacock!! I am in LOVE with your fabulous peacock! Stunning cards. Adorable cards! Love them both! The peacock is just stunning! I love your cards, the diamond border looks great. Your cards are gorgeous - that peacock has so many possibilities and those funky flowers are awesome. Hi Kristie! You always make beautiful cards. Both of your cards are just lovely. That colorful peacock against the blacK,WOW! And those flowers really are funky and fun! Both cards are beautiful!!! Love how you used the different inks!! Love your cards and this SOA Box. Can't wait to get my hands on it! Great cards. 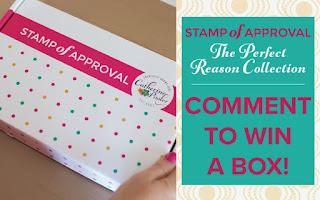 Can hardly wait to get the box, I have so many ideas for that peacock and the paisley stamps! Gorgeous cards!!! Love this awesome peacock!!! Both of your cards are fabulous! The sending hugs card is beautiful and the peacock card is stunning! I love those flowers, so different! I'm not a huge fan either of flower sets. However, this set is quirky and original. I'm a huge fan of the peacock stamp and the enlargement of the tail that you did! That peacock is just gorgeous! Love the rainbow of flowers too. Gorgeous cards, Kristie. I especially love the second one. Beautiful cards! Anxious to get these stamps! Beautifully made cards Kristie. I like the seed pods and their imaginative colours. You never cease to amaze me! Amazing cards!!! I wasn't a fan of those Venus Fly Trap like flowers until I saw your card! Beautiful, love the rainbow of colors. Great cards!! Your peacock looks like he/she is shaking their tail feathers! that peacock is just stunning..i love the floral one, as well. So pretty! I always love your cards and these two don't disappoint. Love the extended peacock feathers and the colorful funky flowers. They are so different and fun! You are right...these funky flowers look like so much fun! Okay these are my favorite so far! STUNNING! I like the colors on your cheery cards. Beautiful cards the inks are so bright . Gorgeous cards and I do love the way you used the rainbow colors. Catherine Pooler inks are AWESOME! Great cards, I just love this collection. Beautiful cards - great new stamps! wonderful cards, love that graphic edge on the peacock and yes those funky flowers look so fun! Stunning cards Kristie. Love the two colours on the peacock card with the b&w and then I see what you've done with those flowers - fabulous. Both of your cards are fabulous, Kristie! I'm in love with your colorful peacock, and the second card is like looking at a garden. Nicely done, my friend! Those funky flowers are just melting my heart!!!! I love them!!! Oh my gosh! Kristie these are fabulous! Loving how you used those little bell flowers. So cute!!! Fabulous and fun cards, Kristy! Only two more days....yay! Love your cards. they are so Clean looking and with the new inks - amazingly colorful. Love your cards! The peacock one is a stunner; so many possibilities with the different elements of that stamp set. The floral one is sweet and quirky :) and again, so many ways to combine the different parts. I love how you featured each of the new stamp colours. Kristie, WOW. Your cards are amazing! The flowers are so pretty, but I am really hooked on that peacock. Great cards. Cute ideas. Great colors used. Love that fun multistep flower! Your peacock is magnificent and I love the whimsical feel of the colorful flowers! I really wish I had your amazing talent. I LOVE your cards! so bright and beautiful!!! and the Peacock is stunning! Love, love these cards! The colors are just so happy. Oh, how stinkin' CUTE!!! I love all the whimsy here, and your cards are so amazing. 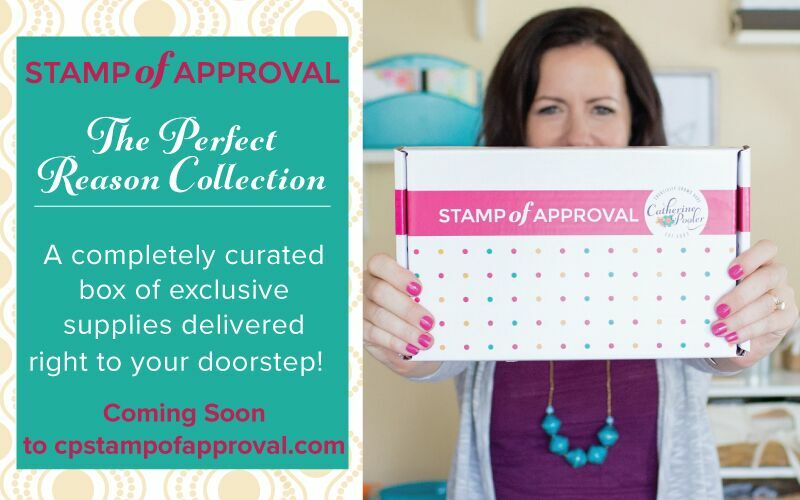 Looks like a great box of goodies!!! I just love your flower card, the colors are the best! Love the cards and of course the bright colors! Beautiful cards. Those pods are so much fun! Both your cards are so pretty...thanks for sharing! Very pretty and elegant! Thank you! I love the funky flowers too! Your cards are beautiful - thanks for sharing! Beautiful cards, I love your clean designs and color combos! Love both cards, especially the simplicity of the hugs card! How adorable. Thanks for the inspiration. Lovely cards and great inspiration! Awesome cards and colors! The flower card is so simple but so cute! I love your 2nd card and all the different colors. Thanks for taking time to share. Love the flower card and the colors are so vibrant! Love the peacock card! You did a beautiful job! Thanks for sharing. Really like all the stenciled cards. Very pretty cards. Really love the colors of your flowers. Absolutely gorgeous cards, Kristie. I'm so excited for this box. I like the way you used the diamond stamp with the peacock. Very pretty! I like your color combinations. Love the dimensions you gave to the card. Really makes the images stand out. Love both cards, especially the color selections for the peacock. Can't wait to get inky fingers with my SOA kit. Will release day ever come! Love the modern, graphic flowers. Omgeeeeeeeee!!! Love the peacock card!!!! Just stunning! Great use of the SOA collection! I love the flower card, the colors are so vibrant! you succeeded very well with the funky, fun colors on the funky flowers. Nice job. You did an awesome job on your cards. They are adorable. Mixed flower garden, yes! Just as it should be! Your "Sending Hugs" card is too cute! I want to make that card! Stunning cards! I am at a loss for words. I just love both of them! Beautiful cards. I love the peacock. Love the peacock and flowers! Gorgeous cards! Your cards are beautiful. Love the colors. Sue Brożek (aka mailboxmoments) Your flowering card has such beautiful vibrant colors. Also, they look like they are dancing and having fun. Great job! The inks are amazing. The colors are so bright and bold on your cards. I haven't liked the peacock much until I saw your card. Now, I have ideas. Thanks. Ooooh your the fancy one ;) Stamp Of Approval looks like so much fun! Beautiful cards and wonderful colour combinations. I love your rainbow flowers! Gorgeous cards from a fabulous release! Love the new stamp sets. And the inks are amazing! This peacock is amazing <3 the flowers are also fantastic. Loved your cards Kristie, my favorite was the hugs flower card. It was so happy without being mushy. Your peacock card is amazing!! So very pretty. Love this SOA box. Thanks for sharing your designs. So pretty, love the peacock colors. Thanks for sharing. Love the colors you've used and the cheerfulness of these cards! Another awesome SOP set! Love your color combo on the peacock. This stamp set is so unique. This colloection is fabulous. Those flowers have to be my favorite. Oh so pretty. Simply beautiful! Love these cards that you made. The border stamp (on the peacock) also added some interests to the stamped images! Gorgeous cards!! Really love the peacock stamp!! Kristie, your cards are my favorite...I didn't think I needed these stamps, but YOU my friend may have changed my mind!! I just love your peacock and your triangle edge sets him off fabulously! I just love your multi-colored cone flowers! Fun idea! Oh wow, both of these card are gorgeous, I really do love the use of a white card base with bold coloured stamps. I really do need to purchase these stamps now that I have seen your cards, such an inspiration. Thank you for sharing. Love the peacock and that diamond stamp on the side is great!! The flowers are so fun!! Really looking forward to this set!!! Such beautiful cards with a plain background. I love the colors. Kristie .... I agree, your Peacock is Stunning. When your card came on the screen, I almost thought I could touch it. That just jumped off the page. So Gorgeous!! Love the color combo. Made me smile. Speaking of smiling, your funky flower card was fabulous as well. So striking in the rainbow colors. As usual, I love your colors and layouts! You do such a wonderful job! Thanks for the inspiration. How so many ladies can be working from their respective home/studio and come up with different cards is beyond me! In love with this SOA! Your cards are absolutely gorgeous, Kristie!! LOVE!! I love all the colored flowers on the second card. Trying to decide what to call them. I think Fantasy Flowers. This is a jaw-dropping beauty! Both cards are very cute, ans the peacock is just goregous! Who could want better? Your cards are wonderful and inspiring . Keep up the good work. I love the funky flower too, but that peacock, wow I love it! Kristie, your first card is amazing!! Gorgeous design and loved your second as well!! Love that peacock!!! Gorgeous cards! That little quirky flower is one of my faves in this collection! Love the strong, harlequin border on your peacock card. This collection is a MUST HAVE! Love those flowers! Can't wait to order them! I love that peacock. Your cards are beautiful. I really like the black diamond border; it really adds to the overall effect. Thanks for the inspiration. Both cards are so lovely - thanks for sharing! I can hardly wait to make these cards! I love the pink feathers of the peacock on the bottom and I love the flower card. I hope I win this set. I'm going to have so much fun with it. Oh my goodness! Those flowers - in rainbow order - they are so cute that way! Your card is card is beautiful! By using the dies, the feathers look like puffy and it really changes the whole look. Two very nice cards! Love the deminsion on the first card. Second one with the rainbow flowers is pure happiness. Love your pretty little peacock, and flowers. I like your cards! Very colorful! I think my favorite stamps are the flower stamps. Your Peacock is stunning. Love It! I love all your cards and the wonderful stamps you used. Wowzers Kristie!!! I'm sooooo with the rest of the group...your cards are GORGEOUS! The colors, the design, the argyle border, the white space....stunning work!